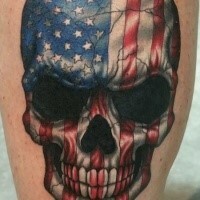 Flag tattoos is the choice not only of patriots of own country, but of many people who feel sympathy for the tattoo art. 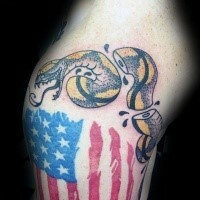 Flag tattoo designs really look patriotic and original, and, as a rule, vivid. Flags of all countries are peculiar but always reveal harmonic choice of colors and symbols. 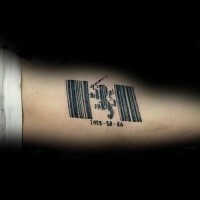 Original persons choose such flag tattoo designs, that represent not a certain country, but a pirate mascot instead – black flag with crossed knives or bones. 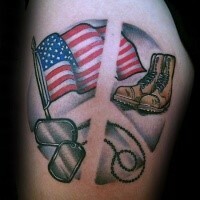 Flag tattoos remained popular in all times and epochs, changing with the interests of generations and world tendencies. 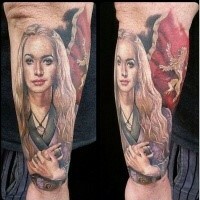 Such tattoos do not have fixed dimensions. 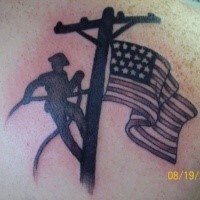 Flag tattoos can be big and can be applied on the whole back or can be small, applied on shoulder-blade or forearm. 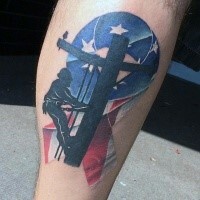 Flag tattoos have always had great meaning for those who decide to apply them. 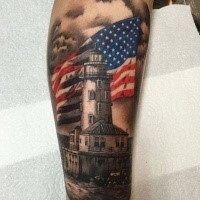 Of course first of all flag tattoo designs are applied to show pride for the country, for its heritage – the place where the person lives with his family. 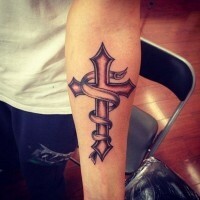 But flag tattoos can represent not only country flags – all other flags are acceptable as well – such as religious symbols or symbols of anarchy for example. 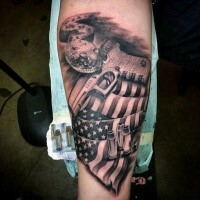 Flag tattoo designs in their majority are rather simple and always containing the design and actual colors of flag of a certain country, but sometimes bring much more style in it to look greater as a flag tattoo design. Sometimes flag tattoos are depicted in the shape of geographical border of actual country that possesses the colors of original flag. 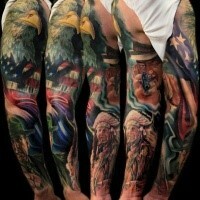 Other flag tattoo designs include the flag flapping on the wind, and others prefer vintage look of their flag tattoo designs. 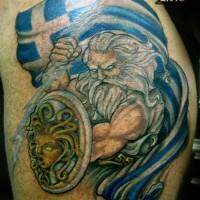 In some cases people may with to bring additional details in original flag tattoo designs, that are connected with their homeland country. 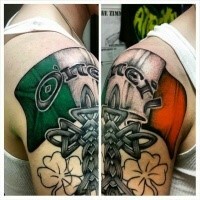 Symbols of particular country are very often used in flag tattoo designs. For example, it is a good idea to add eagle wings to American flag – this will show additional pride and the knowledge of symbolism of your country of birth. 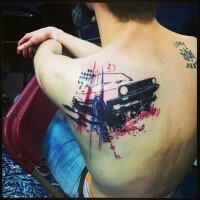 However, people who are willing to show pride not only with their country flags, can choose to create a mix of flag tattoos – this process can be very creative and unique. Here different possibilities can open – first of all several flags can be applied one on another, and even be intermingled. 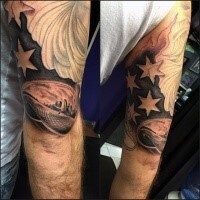 The good idea for original flag tattoo design is to write some inscription, maybe even your own name with the colors of letters representing the colors of flag of your own country. 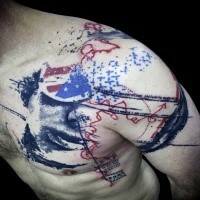 Morphed flag is also very popular – here each piece of flag is bleeding into the nearby piece. 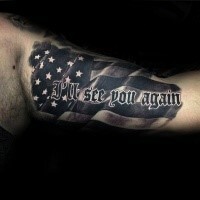 Nowadays many people choose to apply flag tattoo – it can be very emotional and remind them about their own country, especially if they live currently in some other part of the world. Also it is always a good thing to show, because it can inspire and bring joy to many people of your country. 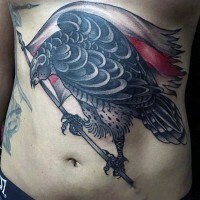 That is why flag tattoos are usually applied to those body parts, that can be easily visible and, such as arms, legs, even chest. 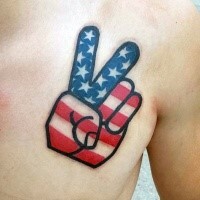 Sometimes people choose to apply flag tattoos even on their necks or their heads. 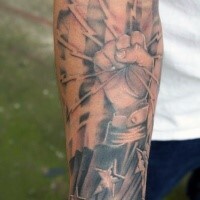 Flag tattoos usually can be presented as a great variety of different flag tattoo designs. 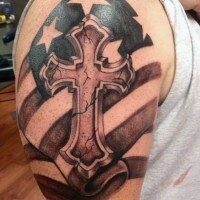 The styles of flag tattoos can look great. 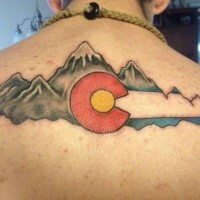 Mostly people, who choose flag tattoo as their choice, want to reveal their pride in homeland country, or just use it as a reminder of their homeland when they are far away from it. 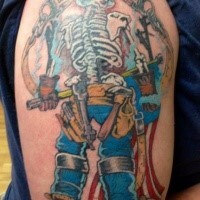 Of course, there is a great variety of the ways in which flag tattoo designs can be depicted. Here the choice is yours and you are only restricted by your own imagination.